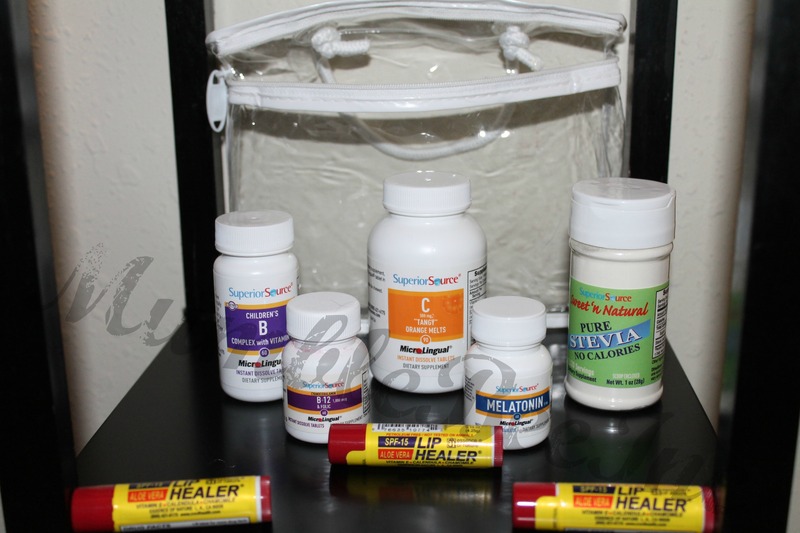 Superior Source Vitamins Giveaway — MumbleBee Inc MumbleBee Inc. Welcome to the Celebrating Women’s National Health Giveaway! Home of Superior Source MicroLingual® tablets, Continental Vitamin Company has provided trusted vitamin tablets and dietary supplements since 1969. Continental Vitamin Company is the manufacturer of the Superior Source product line, recognized as the only source of soft-molded instant release tablets with Under the Tongue Technology™. One (1) lucky reader will win a Vitamin Package valued at $70. Everyone can get these specials! What makes Superior Source UNIQUE? Superior Source Vitamins are MicroLingual® – “Under the Tongue Technology” works fast, as they are quickly absorbed into the body, dissolving in seconds – NO pills to swallow! By swallowing supplements, as much as 50% of the potency is lost in the high acid environment of the stomach. I have always hated taking a pill even the smallest always seemed to get stuck in the back of my throat. I looked as if I was a penguin trying to eat a fish. No lie my family would make fun of me if I ever had to take anything in a pill form. Well recently last year I was diagnosed with a hyperthyroid and have been struggling to find the right dose of medication and to take certain vitamins that I have been lacking plus, melatonin at night. So when I heard of pills that dissolve I had to try them out! Overall I was amazed as to how fast they did dissolve and how the melatonin kicked in for me compare to my usual brand. I will be heading to my local pharmacy store to pick up some extras I did not review here. If you would like to win the packed reviewed in the image below continue on reading on how you could win and try them out for yourself! • BOGO – FREE Vitamin C (Sour Cherry or Tangy Orange) – 500 mg – Buy One Get One Free! “VACATION TRAVEL – FAMILY 6-PACK”… a $90 Value! 1. Vitamin B12 1000 mcg + Folic Acid 400 mcg: No Shot Vitamin B12 MicroLingual Tablets go to work fast under the tongue. Other forms of Vitamin B12 supplementation can result in a loss of as much as 50% of the Vitamin B12 potency in the high acid environment of the stomach. Our B12 with Folic Acid provides essential nutrients for the support of the heart and cardiovascular system. 2. Vitamin C Tangy Orange Melts: Vitamin C is an essential nutrient that cannot be produced by the body, therefore it must be replenished daily. Vitamin C also provides support to the body’s immune system, very helpful in a season where people catch colds and flu. No sugar is added, these products are only sweetened by stevia; this is preferable to most ‘chewable’ vitamin C products that are typically loaded with lots of sugar. 3. Children’s B Complex with Vitamin C: Children’s B-Complex with folic acid, calcium pantothenate and biotin is formulated to provide the nutrients that support optimal health for the production and maintenance of new cells and supports nervous system health, energy metabolism, and healthy heart function. 4. Melatonin 5 mg: Melatonin acts as a natural aid for healthy sleep regulation and the promotion of normal sleep cycles during travel. Chamomile is an herb that works together with melatonin to promote calmness and restfulness. 5. Sweet ‘n Natural Stevia Extract is a naturally sweet dietary supplement used for both hot and cold beverages and are 200 times sweeter than sugar. Studies have shown that steviosides, may support healthy heart function, help to protect the teeth from dental caries and promote healthy blood glucose levels. Superior Source uses of the finest raw materials and a unique blending process to produce the smoothest tasting stevia available with no aftertaste. 6. Lip Healer 3-Pack: All Natural “Lip Healer” Lip Balm is Petroleum Free and contains Aloe Vera,Vitamin E, Calendula and Chamomile to Sooth and Moisten Lips while providing SPF-15 protection from the Sun’s rays. 7. Travel Pouch: This convenient travel pouch with handle will keep your Superior Source Vitamins in one place for easy access whenever you go on vacation! Walgreens, Swansons and Lucky Vitamins. Be sure to stay in touch with Superior Source through: Website | Facebook Promo | Twitter | Retailers for all the latest news! This giveaway will run from 8/2 at 7pm est – 8/16 at 11:59pm EST ans is open only to US and Canada.